Our non chemical approach eliminates the streaking, spotting and discoloration commonly associated with Chemical Cleaning. Don't ruin your roof - clean it naturally. Chemical free roof cleaning - chemical free to save your environmentally safe foliage and protect natural wild life. Don't get left with a roof, that within just a few short weeks of cleaning, starts to look streaky or spots appear with color variations making your home look unkept. Our non-chemical cleaning system uses water to remove bird droppings, sap, pitch, algae, mildew, moss, roof fungus, lichen and the notorious black roof mold so common in Florida. Our Approach To Roof Cleaning - You can't fight nature you can only work with it. Avoid the horror of a streaky and spotty roof using chemical treatments. We're doing our part to help protect you and your family from harsh pollutants that negatively impact your health and hurt the environment. We use state-of-the-art pressure cleaning equipment designed for tile roof cleaning. So cleaning tile roofs, barrel roofs, clay roofs, slate roofs, terra cotta roofs designed specifically for or any other roofing surface is safe and effective. 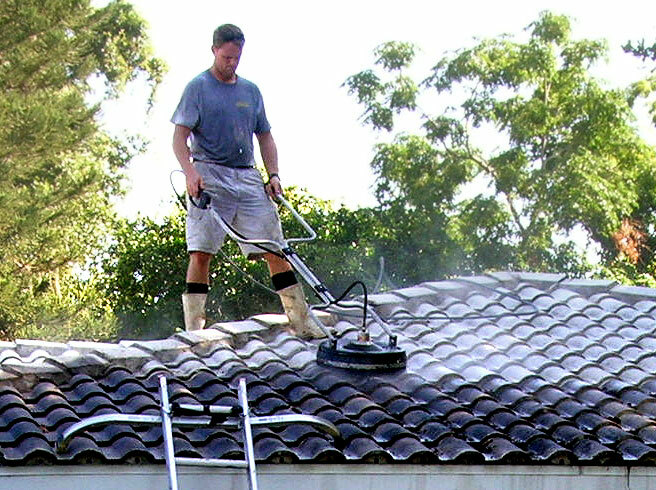 Our services includescleaning of asphalt and fiberglass roofing shingles .. pressure cleaning of flat cement roofing, roofing tiles, metal roofs and rubber roofs. We also offer pressure washing of all exterior areas of your home or office. Providing cleaning and maintenance services ... for people who live a quality life and expect quality from every dollar they spend. Quality service for those who expect top notch service. ... All Around Cleaning Services gets the job done right. Serving Sarasota, Manatee, Lee and Charlotte Counties in Southwest Florida.